By the end of 1940, sixteen months after Adolf Hitler had plunged Europe into war by in­vading Poland, the num­ber of Jews killed by Nazi Ger­many approached 100,000. But in 1941 the death toll grew expo­nen­tially as mass mur­der of Jews became state policy. By the end of 1941 roughly one mil­lion Jews had lost their lives. In late Septem­ber of that year, osten­sibly in retali­a­tion for a series of bombings that destroyed many buildings in the cen­ter of the newly occupied Ukrai­nian capital, Kiev—buildings that included Ger­man army head­quarters and the Hotel Conti­nental, where Ger­man officers resided—high-ranking Ger­man offi­cials in the mili­tary and the SS (Schutz­staffel) made plans to exter­mi­nate the Jews of Kiev and its sub­urbs. (When the city fell to the Ger­mans on Septem­ber 19, 1941, over 875,000 people lived there, of whom 20 per­cent, or 175,000, were Jews.) Trilin­gual wall pos­ters all over Kiev ordered Jewish resi­dents to assem­ble at speci­fied loca­tions at 8 a.m. on this date in 1941. They were to bring with them docu­ments, money, valu­ables, as well as warm clothes, under­wear, and so on. 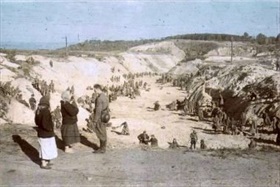 Expecting to be deported to labor camps by train (a rumor to that effect was circu­lated by the Ger­mans), Kiev’s Jews were in­stead marched in groups of one hun­dred to the Babi Yar ravine on the city’s out­skirts, ordered to un­dress, stack their belongings, and then led in groups of ten to the edge of the ravine, where they were machine-gunned by a special team of Ger­man SS troops, sup­ported by Ger­man army and police units and some Ukrai­nian-speaking troops. The mas­sacre of 33,771 Jews on Septem­ber 29–30, 1941, is con­sidered to be one of the three largest single mas­sacres in the his­tory of the Holo­caust and the largest in the his­tory of the Soviet Union. There were 29 known survi­vors. In the months that followed, thou­sands more were seized and taken to Babi Yar where they were exe­cuted. It is esti­mated that more than 100,000 resi­dents of Kiev of all eth­nic groups, mostly civil­ians, were mur­dered by the Nazis at Babi Yar. A con­cen­tration camp was also built in the Kiev suburb of Syrets (Syrez or Syrezky), seve­ral hun­dred yards from the Babi Yar ravine. The Syrets camp housed pri­soners per­ceived to be oppo­nents of the Nazi regime, mainly Jews. About 25,000 Ukrainians died in the camp. Left: Johannes Hähle, a military photo­grapher attached to the Ger­man Sixth Army, used a single roll of color film to photo­graph the after­math of the Babi Yar mas­sacre early in Octo­ber 1941. 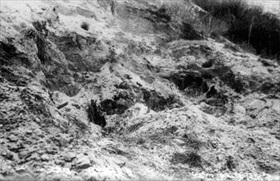 About 300 POWs were taken to the ravine to bury the bodies. 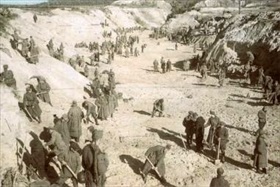 Right: In this photo camp inmates level the earth over the mass graves. A Ger­man sol­dier in the fore­ground shows two Ukrain­ian women the acti­vity in the ravine below. The mass mur­der of Jews in Kiev lasted until Octo­ber 3, 1941. During the following months this Valley of Death con­tinued to be used as a killing site for Jews, Ukrain­ian civil­ians, Soviet POWs, and Roma and Sinti (Gypsies). According to Soviet sources 100,000–200,000 peo­ple were mur­dered at Babi Yar up until Novem­ber 6, 1943, when the area was liber­ated by the Red Army. As stated in the “Opera­tions Situa­tion Report of Ein­satz­gruppe C” of Octo­ber 7, 1941, the Ger­mans claimed to have shot 33,771 Jews in Kiev between September 29 and 30, 1941. Left: Before the Germans retreated from Kiev, they attempted to con­ceal the many atro­cities they had com­mitted at Babi Yar. For six weeks from August to Septem­ber 1943, more than 300 chained pri­soners from the Syrets con­cen­tra­tion camp were forced to ex­hume and burn the corpses. On Septem­ber 29, 1943, 15 pri­soners managed to escape; 312 of their com­rades were killed by the SS either during or on com­ple­tion of the work. This photo and the next one were taken by a Soviet team that visited the site after the Ger­man retreat from Kiev. West­ern jour­nalists were also taken to the site. Hun­dreds of photos like these became exhibits for the pro­se­cu­tion at the post­war Inter­na­tional Mili­tary Tri­bunal at Nuremberg. Right: The corpses were cremated on funeral pyres built on iron rails and stood as tall as a two-story house. The piles of corpses were not set on fire at regu­lar in­ter­vals. Only when one or more piles were ready were they covered with wood and soaked with oil and gaso­line and then ignited. Each funeral pyre took two nights and a day to burn com­pletely. After­wards the prison detail col­lected the remaining bones and pul­verized them with tomb­stones taken from the near­by Jewish ceme­tery. Finally the ashes were in­spected in order to collect any remaining silver and gold. The ashes were scattered on farm­land in the vicinity. 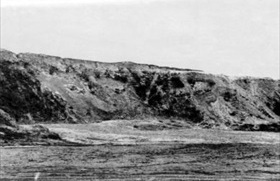 Left: Built in June 1942 the Syrets concen­tration camp was located near the Babi Yar ravine. 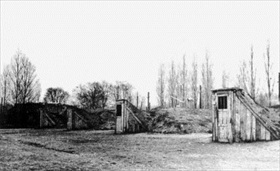 Men and women were housed in wooden barracks and dug­outs with doors and stairs leading below ground, as shown in this photo. The in­mates were under­fed and many starved to death, with daily mor­tality of around 10–15 peo­ple. Besides Jews, the in­terned also included Com­mu­nists, cap­tured Soviet parti­sans, and Soviet POWs. Inmates began to be evacu­ated to other camps to the west in Septem­ber 1943 and in late Octo­ber the camp was liquidated. About three mil­lion Soviet pri­soners of war perished in German captivity. Right: After the Red Army retook control of Kiev on Novem­ber 6, 1943, the Syrets con­cen­tra­tion camp was con­verted into a camp for Ger­man POWs and oper­ated until 1946. 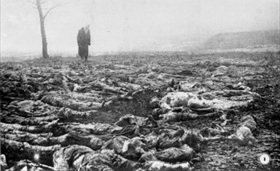 This picture, entered as evi­dence at the Nurem­berg Trials, shows lines of Soviet corpses that had been dug out of camp trash pit. 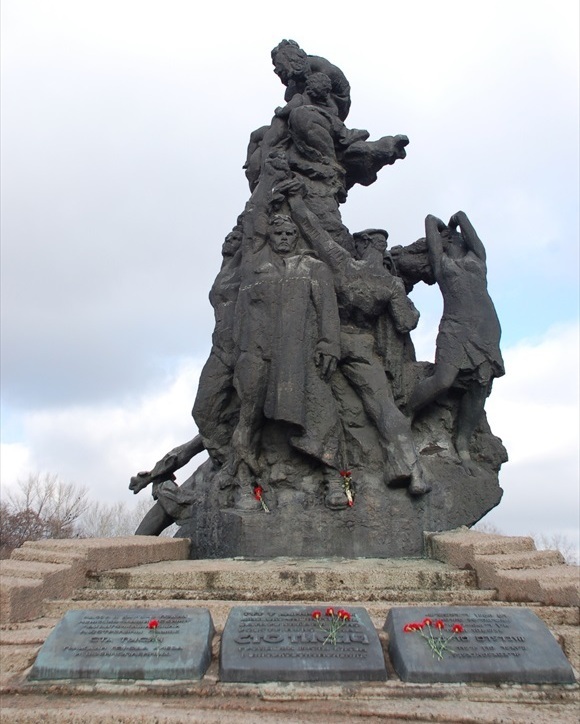 Below: Monument to the Murdered Ones in Babi Yar, Kiev, Ukraine. For poli­tical rea­sons an offi­cial memo­rial was not built at the killing site until 1976. The first memo­rial did not men­tion that most victims were Jews. The mas­sacre of 33,771 peo­ple on Septem­ber 29–30, 1941, was the largest single mass killing for which the Nazi regime and its col­labo­rators were respon­sible during their cam­paign against the Soviet Union. Only ten per­cent of the Babi Yar dead have been identified.